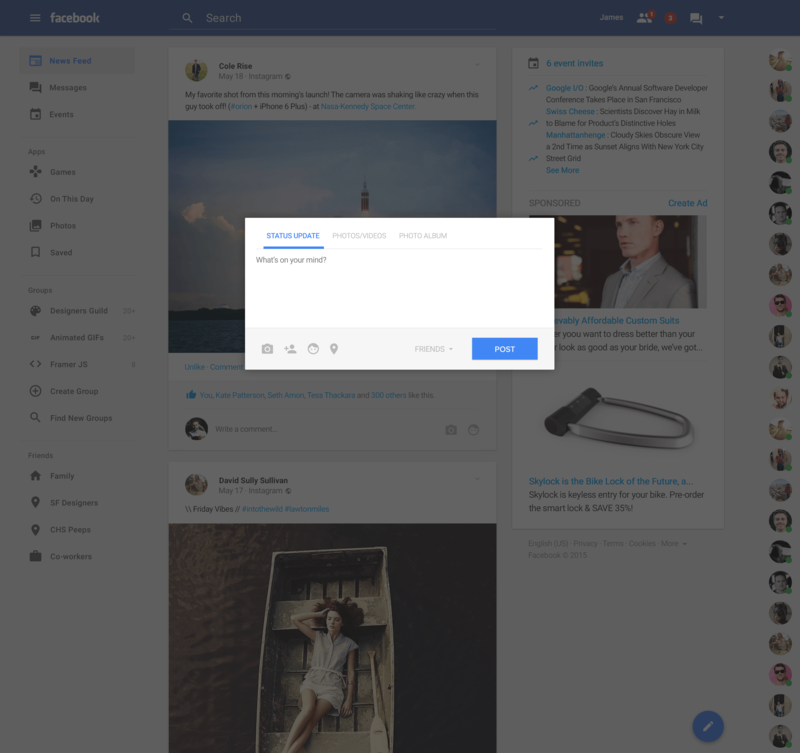 James Bergen Plummer come up with a fresh and simple Material Design concept for a Facebook facelift. We are used to seeing redesign concepts for social networking sites where the designer’s gone all out to impress and ended up with something that doesn’t really bear much resemblance to the original. 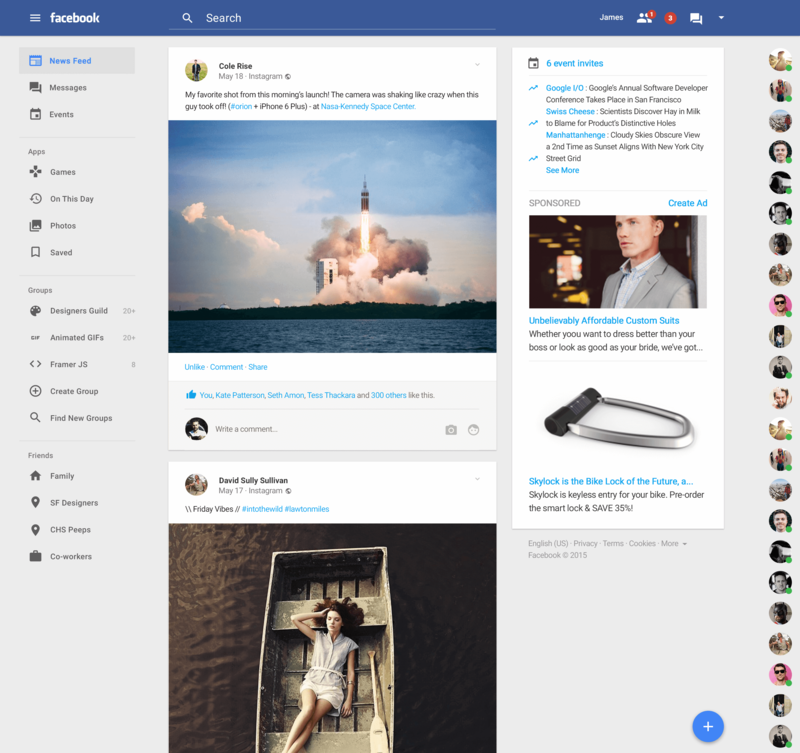 However designer James Bergen Plummer has taken the opposite approach in putting together a redesign concept for Facebook. – I do not like the idea to put each post in a card. It is very similar what FB has now and could be more clean without these borders. Material Design does not mean to put everything in cards in any situation. – Also there no need for showing “Unlike”, “Comment”, “Share” actions all the time – these are too many links on page which distracts user from content. – I like the idea to remove the publisher at top because there is more space for stream content now. But the plus (the button is ok) on bottom right which is just a 1:1 copy from Google Inbox is way too far from existing user experience. In Google Inbox it is ok because on bottom right the user can starts a conversation which is similar to FB or old Google chat. So it shouldn’t be in chat area. – The same with the lightbox effect for new posts. I like the existing UI which shows new content where it will be shown after send – at the top. so not very convincing concept in my opinion. another note: the top and left menu is also a 1:1 copy from Google Inbox. Here it is not bad. So the left menu will not be shown directly but it shows that the designer only puts the FB stream in middle of a Google Inbox screen. To be honest i like how it looks. Its kind of a refreshed look to the old boredom. Its not that facebook looks bad, its just new design somehow makes it more appealing at first sight. It still looks and feel like facebook, but new. Hello Sir .. I need Material Design concept Script….